Well, I finally did it. I switched my email provider from Aweber to ConvertKit. I’ve been on Aweber for over 5 years – pretty much ever since I started blogging. And while it’s been good to me up until this point, I don’t feel like it’s evolving with the times very well. I feel like 2016 is going to be the year of marketing automation. Well for the first time ever, advanced marketing tools that used to only be available in very high end (and expensive) email providers, are now becoming much more affordable. This along with the fact that people’s attention spans are at an all time low, and it’s harder than ever to get people to open an email – means there’s a big opportunity for people who take their marketing a step further. What marketing automation allows you to do is to make sure your readers are getting the information they want. Right now I send out my weekly newsletter to pretty much my whole list. How much you wanna bet, some people would rather just see my emails about new blog posts? Or just emails about the video blog? Or just things about Location Rebel? Some of the newest email tools are making it incredibly easy to do this (and much more). For the last year or two Aweber, just wasn’t doing it for me anymore. Every time I wanted to do something a little more advanced, it didn’t seem possible without a lot of extra work using APIs and getting a developer involved (or using AW Pro Tools, which I was not impressed by). But in the end there were three main reasons why I switched from Aweber. This is probably the biggest complaint you’ll see about Aweber, and it’s amazing to me they haven’t fixed this yet – it would do wonders for their brand loyalty. When someone signs up to one of your lists, it counts a subscriber. Makes sense. If that same person signs up to a different list with the same email address. New Subscriber. If they unsubscribe from one list, and are still on the other. Still two subscribers. So in some cases I had the same person being counted as 6 different contacts, just because they were on different segments of my list. This is totally unacceptable in my book, so when I hit a threshold where I was having to pay more money, I got serious about looking elsewhere. Along with the way they unfairly track contacts, they make it really difficult to segment and move those contacts around. Most of the new email providers that you see really doing well these days use tags instead. So instead of the same email address showing 6 times across 6 different lists, there’s just one email, and those different lists or segments are tags. If someone clicked a link in Aweber, I couldn’t easily then send them different content or segment them differently based on that. So what happened was I was sending everything to everyone, without giving them good options to tell me what they did want. I also waited until Aweber rolled out their new campaigns feature before jumping ship. It’s a step in the right direction, but still has a looooong way to go and left me underwhelmed. Editing emails in Aweber has never been all that user friendly for me. When sending out my newsletter, it seemed to automatically change font sizes and colors on me for no apparent reason. The system just overall felt a little cumbersome. Every time I sent an email it seemed like I ran into some little bug that made things more difficult than it should be. I don’t mean for this to be a huge bash Aweber blog post. They do a lot of things right, and have generally served me well for the past 5 years. I just think that for a company that’s been around as long as them, they should be more on the leading edge of some of this stuff. So, with all of that said, why did I end up switching to ConvertKit? Believe me, a lot of research and effort went into this. It has an integration with Rainmaker. I’m moving Location Rebel over to the Rainmaker platform, and I wanted solid integration with them and whatever email provider I chose. Tagging System. ConvertKit uses a tag system, and makes it incredibly easy to tag and segment however you want. Good looking forms and landing pages. I’m not a technical guy, nor am I designer. And I loved the fact I could easily add custom forms to any post I wanted, with minimal effort and make them look good. There were a few other reasons, which I’ll highlight below, but those were some of the fundamental ones. ConvertKit is a relatively new company, only having been around for a couple years. Their founder Nathan Barry, is a friend of mine, and I’ve heard him talking about it since before they’d even launched. I’d been following along with their growth, and while I was reluctant to trust the most important asset of my business to such a new company – but clearly, they finally won me over. There are pros and cons to working with a small startup in this capacity. One of the big pros, is even though their team is small, they go out of their way to provide personalized service to their new customers. If you have a list of a certain size, they will essentially do all of the migration for you. Matt and I had a phone conversation, and then not only did they help me get my entire Aweber list over quickly, they helped with some form customization on my site to make sure I was happy with the way things were looking. The whole process took about a week, but admittedly, I’m now working through an overhaul of my emails to take advantage of the new capabilities. One of the things I love about ConvertKit is how easy and simple everything is to use. Sure, as with anything there’s going to be a little bit of a learning curve – but honestly, it isn’t much. 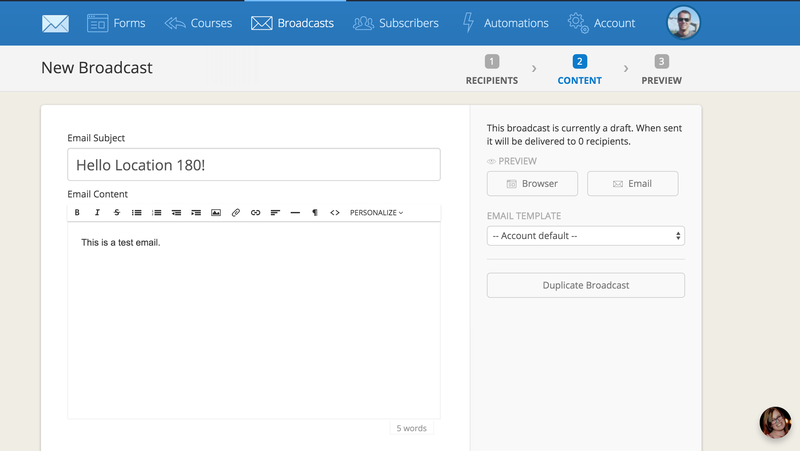 The primary menu items of Forms, Courses, Broadcasts, Subscribers, Automations, and Account are incredibly clear. I’ve been able to easily create the forms I need. And once I understood that I should setup any new tags, and any new automations, before creating the form – everything has been smooth sailing. The home screen does a decent job of allowing me to quickly view my list growth and conversion numbers on my forms – however I’d like to see more customization here, as the way it’s presented isn’t necessarily my favorite. Sending my first broadcast was really easy as well. I will say that some of the customization ability is still a little bit lacking (as far as I can tell), compared to more full featured services. Without digging into HTML, you can’t seem to customize font, color, width of the email etc. Seems like a pretty weird thing not to include, but could go with their theme of making things as simple as possible – as they are targeting the power blogger or author – not the power internet marketer. Bottom line on first impression: I made the right choice. Everything is incredibly easy to use in ConvertKit, and gives me much more power and flexibility on the marketing side than Aweber did. Let’s look at those two components for a minute, as that was one of the primary reasons I moved over in the first place. It’s incredibly easy to add a tag to a new subscriber by way of automation. The automation options in ConvertKit are extremely clear. Basically for any form I have on a site, when people sign up I can assign automations that make sure people get the content and a tag specific to what they wanted. So if someone signs up for our free email 6 step email course I can tag them “Location 180 Welcome”. Once they finish that, I could create an automation that will move them to a sequence that sells Location Rebel and maybe tag it “lrsales1”. If they don’t buy, I could then have an automation that moves them over to “L180primary” where they just get my broadcasts and newsletters. It takes less than 10 minutes to setup this functionality. I can have separate forms that tag people based on where they signed up. If I have a form on a travel post, the follow up email sequence can be all about travel. Or if it’s on a post about niche sites, I could give them more content based on that. So you can see how powerful it is to build out your automation and custom tailor your content to the interests of your readers. Overall my experience with ConvertKit has been positive and exactly what I’d hoped it would be. However, there have been a few minor things that I wasn’t anticipating. One confession I have to make is I was pretty much already sold on a different email provider, Active Campaign. Active Campaign is built more for marketers and is incredibly robust in what it allows you to do. However, it doesn’t integrate with Rainmaker – so that became a non-starter. I spent a significant amount of time with Active Campaign, and there were a few things it does that I expected ConvertKit to be able to do. For instance say I send 3 emails each with a different link. With ConvertKit, I’m able to tag the people that click the each link, and I can send a separate email to any one of those three tags. But what if I want to send an email only to the people who have clicked all three of those links – as that person is obviously highly engaged. Note: This is a feature that is coming out very shortly, however at the time of this writing it wasn’t yet available. So this is kind of nit-picky, but it also seems really weird that this isn’t an option. If you’re creating your autoresponder series of emails, there’s no way you can do a test send of those emails to you. You can do a test send in a broadcast, but not in a “course”. So they only way to test a course email to ensure the formatting is correct is by copying it into a new broadcast and sending the test from there. I mentioned this earlier. One thing I liked about Active Campaign was just how customizable all the emails were – and they had tons of templates that could allow you to do just about anything you wanted. When sending emails from Convert Kit without digging into HTML, I haven’t been able to adjust font, font size, color, or email width. This isn’t necessarily a huge deal, as I wouldn’t do anything dramatically different from the way it has things setup – but I’d like the option to easily make minor tweaks from within the visual editor. Here’s the thing about all three of these minor complaints: they come with the territory of working with a relatively new company. ConvertKit while growing rapidly, still has a small team, and they can only pump out so many new features and updates. I knew this going in, and I’m also confident that over the coming months and years – all of this will be addressed. A nice benefit of a small company too is that I know I’ll get a response, and that feedback I have will be heard by people who actually have the power to make a change. Anytime I’m logged in there’s also a handy little help bubble, with a full string of my conversations with their team. Any question I ask usually gets an answer within a couple hours – and I really appreciate knowing I can easily get ahold of someone. Who is ConvertKit Right For? Let me see if I can answer that. I look at ConvertKit as kind of an intermediary between the Awebers and Mailchimps of the world and some of the more expensive solutions like Infusionsoft or Active Campaign. I think the perfect market for for ConvertKit is the blogger who wants more advanced email and marketing capabilities without sacrificing ease of use. ConvertKit is probably the easiest email solution I’ve ever used. So if you’re debating between this, Aweber, or Mailchimp. It’s an absolute no brainer: go with ConvertKit. You won’t regret it. The only downside I can think of compared to those is that because it’s a new company there aren’t as many integrations with various services online – but for the most part this really shouldn’t be an issue. If you consider yourself less of a blogger and more of a marketer, then you might look into Active Campaign, as it’s funnel capabilities and automation features are much more robust. While Active Campaign isn’t difficult to use, it can be very easy to get overwhelmed. So I don’t necessarily recommend this for people just starting out. If you don’t already have an email list, here’s the price comparison for 1,000 users. Active Campaign: $17/month ($9/month under 500 subscribers). This is also for their basic plan. The plan I recommend and was looking at starts at $49/month. So yes, ConvertKit is a little bit more money if you’re just starting out, but I promise you it’s money well spent. For what it’s worth, for the level I’m at, Aweber was charging me $216/month and ConvertKit is $199. So as your list grows ConvertKit actually ends up being considerably less than some of the other options out there. Also notice I don’t really mention Infusionsoft here, as that’s more of an all-encompassing CRM and marketing system. The ones I looked at are just email marketing providers. I honestly believe ConvertKit is going to be the right fit for the vast majority of people reading this. It’s combination of ease along with more powerful marketing features, and quick growth is a really good combination. I’m excited to see them address some of the issues I brought up earlier, but despite those reservations, I have absolutely no regrets about making the switch and recommending the service. Have questions about ConvertKit and my experience with it? Leave a comment below, happy to help however I can. Urgh, I’ve been thinking about leaving AWeber too. Aside from the clunky interface (annoying but not enough to leave based on that alone), the thing that really bugs me is that there doesn’t seem to be an easy way to allow people to opt-in for different things. That’s a good question, I THINK there’s a way you can add a checkbox with CK that can do just that (as I’ve seen it in one of my forms). I’m just not entirely sure how to customize it, but I’m pretty sure it can be done. Exciting news – we’re launching some updates to the app very soon that will allow for subscription selection like you described. We’d love to have you join the ConvertKit family! I’ve been seriously thinking of making the same change. So far it’s been a really good choice. My guess is for the type of stuff you do, it’d be a good fit. Happy to answer any questions about my experience with it. One thing holding me back is that ConvertKit has a donut hole where it is more expensive than Aweber. For very small lists it is cheaper. For very big lists it is cheaper. I have about 20k in my list, and for that number, it is more expensive. So thats right around where I am. As soon as I got over 25k in Aweber, it went up from $150 to $200 and then some. But also because of the way aweber counts its contacts, when I moved over to CK my list shrunk by a few thousand subscribers when it got rid of duplicates – so it may do the same for you. Also, even if it is marginally more expensive, it’s 100% worth it for the automation in my mind. Thanks Derrick! I looked at Drip as well, and have generally heard good things. How has the deliverability been so far? I’m sure it’s been good or you would have covered that but wanted to ask. I’ve become more and more frustrated with Aweber as well. Seems they’ve become reluctant to add features (segmenting?) that are a no-brainer. So far deliverability has been good, but open rates are down a bit. Need to test more, and I think thats due to other factors rather than ConvertKit. But will update as I dig in more. Hey Sean, this was good info. Just curious why you’re not using the email service that comes with the Rainmaker platform? Sue, there isn’t much of an email service that comes with Rainmaker. At least not yet. I know that’s in their plans, but anything they do have is super barebones at the moment. Wow, in depth post here. So much food for thought as my own list continues to grow. For now I’m sticking with mailchimp, as I don’t need to do all of the whacky segmenting… Yet. Once I hit around 5,000 it’s gonna be time to take the leap, I think. Great write up, dude. I’d say your product reviews are some of the most valuable you put out! Thanks man! Need to do more reviews on the site, people always seem to enjoy them. The one problem I had with ActiveCampaign was a lack of plain text style rich text emails. I noticed slightly lower open rates with ConvertKit too. Maybe Nathan should add a custom SMTP server feature. Similar to MailChimp, I’m sure many emails end up in Gmail’s promotion tab. I’ve tried Infusionsoft in the past, I think ConvertKit is more flexible and user friendly. Going the Infusionsoft route often requires hiring a third-party to set up Campaign Builder, despite charging a nice initial consultation fee. Are you planning to eventually move your blog to Rainmaker or just Location Rebel? Curious, what features led you to pick Rainmaker over Zippy Courses? Yeah I’d be really curious to talk to Nathan about that. Kind of surprising that this has been the case. Zippy courses wasn’t quite full featured enough. Right now I’m using like 6 different services to run LR (Optimize Press 1, OP 2, Vanilla, Visual Website Optimizer, Wishlist etc). I like being able to have it all under one roof. Sean, I tried ConvertKit but I had to bail because I really rely on the segmentation features of MailChimp. I need to know if my readers are opening, clicking, and interacting with my emails. The tagging is a great feature in ConvertKit, but another ding is that I pay for every email. MailChimp has no limitations on number. Would love your thoughts. Thanks. Interesting. How many emails are you sending out that causes you to get paid for individual emails? And I feel like CK has more advanced segmentation than Mailchimp does. Sorry I wasn’t clear. What I mean is CK caps the number of emails I can send–or else ups my price–and MailChimp doesn’t. The segmentation that CK lack is being able to track open rate and click rate. I don’t want to keep subscribers who don’t open emails. Thanks. We’re launching some updates really soon that will allow for just that inside ConvertKit. Might be worth a second look once everything goes live. I’m about to make the switch from Mailchimp to ConvertKit so it’s helpful to see you endorse it after using it. Thank you. Great review. I’m sorry to a few people in this thread resist the switch purely for cost reasons. For me, more ease = saving time = more of the life I want. Totally worth a few more dollars. Nice! Let me know if I can help with anything as you make the transition. Curious as to CK being able to perform basic tasks that Leadpages does (leadmagnet deliverability, easy landing page set-up) Thinking of dropping both Mailchimp and Leadpages for ConvertKit, with email marketing being my biggest objective. Thoughts on that? The landing pages are definitely not as robust as what Lead Pages offer. Its pretty easy to do basic ones, but they arent nearly as customizable as say, an Optimize Press. So it’s a good feature to have, but as to whether it could replace Leadpages really depends on your goal with it. Such a helpful, in-depth post. We migrated several years ago to Aweber primarily because address acquisition was easier than Constant Contact. CC’s composition interface and reader behavior tracking was light years better, so Aweber has been a big disappointment as you pointed out. Not sure I’m up for the trauma of yet another switch, but it sounds as though CK would be a good one to look at when I’m ready to throw in the towel. 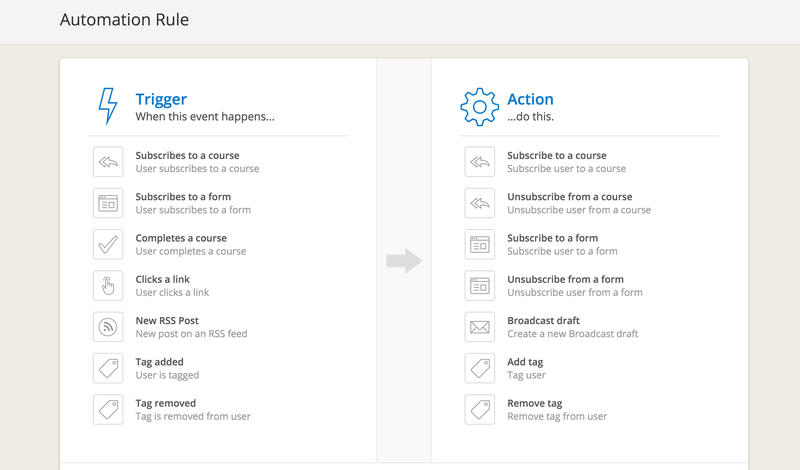 Since bailing on mailchimp for activecampaigns tagging and automation abilities I’ve always been curious why people stuck with Aweber, so thanks for sharing about your transition. I’m stoked for the possibilites convertkit will open up for you! Curious, did you consider Membermouse when evaluating your next membership platform? A few of my friends love it but I haven’t made the switch yet from woocommerce + groups plugin yet. My worry with Rainmaker is that it sounded limiting in its ability to be customized or play with other plugins. Thanks for such an in depth post. As I mentioned to a few of your readers here, we’re working hard to release some updates that will address the concerns I’m seeing. I love hearing what’s working and what’s not for our customers like you so that we can continue to improve the product. We appreciate you! Sold! Thanks for the review, Sean. Signing up now using your link. Thanks dude! Let me know if I can help with anything as you get going. Thank you for the very in-depth review of ConvertKit. I was interest in their service but wasn’t sure if they are a good match for me. After reading your review, I really want to try them out and see if ConvertKit works for me. Thanks for the great article! It was helpful in confirming my decision to use ConvertKit. Great article. I’ve used Constant Contact, Convert Kit, Mail Chimp, and Active Campaign. Currently I’m on Active Campaign. However, I’m about to switch back to ConvertKit because my open rate for the newsletters for both my businesses were 60-70%. MailChimp and ActiveCampaign are only showing 20-30%. But part of me is wondering if ConvertKit’s numbers were correct? Have you found much difference in your open rates? That’s interesting Rajam. I’m now on Active Campaign (moved from Aweber) but haven’t launched my business yet (about to). Obviously deliverability is vital. Wonder if anyone else has anything to add to this? Thank you Sean for this review. Looking into switching to ConvertKit as I heard great things about them. Not as excited about the price – our business is small and local and therefore our list is under 1K…Does anyone know if ConvertKit offers a lower price or free version for smaller lists/businesses? For under 1,000 subscribers it’s only $29 a month, so really affordable as far as full featured email automation platforms go. Any other questions I can help with? Sean, we’re well into 2017. Any regrets with CK? Probably not, but anything on your CK wish list?